Boyle’s law is the gas law that explains the inverse relationship between pressure and volume. This relationship expresses that the absolute pressure exerted by a gas will always be inverse to the volume of the gas as long as temperature and the amount of gas remain the same. As the volume of a gas increases, the pressure put on that gas will decrease. Likewise, as the pressure put on a gas increases, the volume of the gas will decrease. This relationship can be easily observed with everyday phenomena like pumping air into a tire and taking in a breath of air. Robert Boyle was born as the son of the Earl of Cork and was given an education that was heavily focused on fine arts and sciences. He had many incredible opportunities for his studies, including studying under Galileo Galilei in 1641. In the early 1640’s Boyle had developed a keen fascination with science that was only encouraged by his recently acquired wealth after his father’s death. He used his money to fund his research and concerned himself with many scientific endeavors. He did many studies with his research assistants during this time. In the early 1650’s, Boyle would move to Ireland for a time to pursue research from his inherited estates. He would soon leave, however, discouraged by the lack of scientific endeavors in Ireland and the extreme inconvenience with trying to procure scientific tools. Boyle received many objections to the work that was published in “New Experiments Physico-Mechanical” and worked diligently to answer them and prove his theories. While answering objections brought to him by a critic named Francis Line, Boyle first mentioned his theory of the inverse relationship of pressure and volume concerning gas. Though Boyle acknowledged that he had been influenced by work put forth by Henry Power in 1661, the fact that he proved the work to be true with his machine is why the gas law was credited to him. He did try to cite the original creator of the hypothesis, but mistakenly identified Richard Towneley as the author. Regardless, Boyle was able to publish proof of the law in 1662. This law was fantastic progress and would go on to help build the foundation of the ideal gas laws. While using his replica of Otto von Guericke’s vacuum pump, Boyle worked to investigate the properties of air in the pump. He considered air to be a fluid of particles at rest between springs and was searching for a way to prove his theory. To prove his point, he created a closed system using von Guericke’s pump and a J-shaped tube. He inserted mercury on one side of the tube and pumped air into the other side of the tube. As he conducted this experiment, he realized that he had altered the volume that the air in the tube took up, but hadn’t changed the amount of air in the chamber. Boyle continued to repeat the experiment to ensure that his results were accurate. When he had accomplished this, he was able to officially make a connection between the inverse relationship of volume and pressure. Using the vacuum pump, Boyle was able to ensure that the J-shaped glass remained empty until he was ready to pump in his quantified amount of air for the test. Then, by adding in his mercury, he was able to determine that even though the amount of air didn’t change, the volume of air became smaller with the increased pressure that was added by the mercury. This allowed Boyle to establish the inverse relationship that can be found between volume and pressure, so long as temperature remains the same. Boyle’s Law or Mariotte’s Law? There is sometimes speculation as to whether Robert Boyle or Edme Mariotte should be credited with what is commonly called ‘Boyle’s Law.’ The reason for this is because Edme Mariotte discovered the same law in 1676, but also included the fact that air volume changed with temperature. Although there are some who do refer to the law as Mariotte’s Law, it is generally recognized that Boyle achieved proof of the law first. Understanding the inverse relationship between volume and pressure has very important applications to our understanding of the world around us. Boyle’s law helps us understand how gasses function when they are confined to a closed space. This law is used in many every-day applications from determining the amount of air that is needed to inflate a pool floatie, to ensuring that a tire maintains enough PSI (pounds per square inch) to carry the weight of a vehicle on the road. In this formula, (P) represents the pressure of a gas, (V) represents the volume of a gas, and (k) represents a constant. Boyles law can also be used to solve for the pressure or volume of a gas if the original pressure and volume are known. The equation to solve such a problem is shown below. This equation shows that (P1), which represents the original pressure , multiplied by (V1), which represents the original volume, is equivalent to (P2), which represents the new pressure, multiplied by (V2). Although it may not seem like a law that holds a lot of applications outside of modern day science, Boyle’s law is used to propel some of the most simple but ingenious inventions that almost everyone has come in contact with at least once. It may be strange to think that a tool used by artists could be so dependent on Boyle’s law, but the spray can is actually one of the best examples of how the law can be put into action. The spray can implements Boyle’s law and the knowledge of boiling points to make painting a more efficient task. The can itself is filled with two different products – the paint and a liquified gas. The liquid has a boiling point that is below room temperature, which means that if it were introduced to thermal energy at a room temperature, it would transition from a saturated liquid to a saturated vapor. Because they are contained inside a pressurized can, neither of the products can be affected by the outside environment unless the seal is broken by the nozzle. 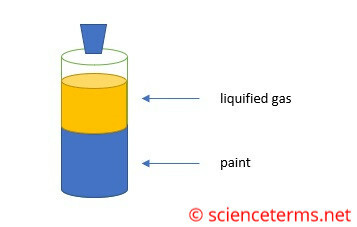 When the can is shaken before being used, the liquified gas mixes with the paint. Then, when the nozzle is pushed down, the room temperature air comes into contact with the liquified gas and causes it to reach its boiling point. When the boiling point is reached, the liquid turns into a gas. As the liquid transitions into its gas form, the space inside the pressurized can becomes too small for the gas, which has expanded rapidly in its new state. It seeks to find a more suitable pressure, which propels it outside the can. Because the gas has mixed with the paint, the paint is also propelled outside the can with an impressive force, resulting in a faster way to paint a surface. Boyle’s law is also critical in understanding how to properly dive without causing sickness or sudden death. This phenomena is caused by the increased pressure that is put upon the diver as they descend into lower waters. Because descending into water causes increased pressure to be put on the body, there is also a significant decrease in volume – specifically in the volume of the lungs. With an increase in pressure and a decrease in volume, the gas molecules need a place to go. They are absorbed into the blood to help compensate for the lost volume in the lungs. Some of the gasses are also absorbed into areas near the joints. As the diver begins to ascend back to the surface, however, Boyle’s law goes to work again. The pressure on the diver’s body lessens, and as a result the volume increases. This means that the gasses are able to expand back to their natural size and refill the lungs. When the diver ascends slowly, the gas is released slowly and the diver is able to return to the surface safely. When the diver ascends too quickly, however, complications arise. 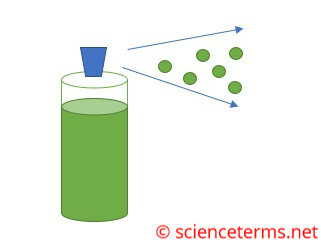 Rising to the surface without allowing the gasses to disperse slowly causes the gas to make the blood foamy. The gas between the joints also expands quickly, causing severe pain and discomfort. This leads to many different complications. At the very least, the diver is given severe cramps and pain that forces them to bend over in pain – hence the name ‘the bends.’ At worst, this phenomena can lead to instant death. Using Boyle’s law to solve for an unknown variable is a fairly simple process. All that is needed is either two measurements of volume and one measurement of pressure, or two measurements of pressure and one measurement of volume. At 1.85 atm, a sample of gas takes up 4.75 L of space. If the pressure on the gas is increased to 2.65 atm, what will the new volume of the gas be? Once the variables have been plugged in, all that remains necessary is to solve for the missing variable. Using Boyle’s law, we are able to determine that the new volume of the gas should be about 3.32 L.
2. A gas at 3.2 atm has a volume of 6 L. Before it had a volume of 6 L, it was held at 4.8 atm. What was the original volume of gas? 3. A gas at 4.3 atm has a volume of 5.6 L. If the pressure is reduced to 2.3 atm, what is the new volume?